I’m sure most of you have heard of “Meatless Mondays.” If you haven’t, it’s not a hard concept to figure out. I don’t do this every Monday, but I try as often as possible. I can always use an excuse to kick off my week in a healthy way. I’ll also use Meatless Mondays as a way to use up uneaten vegetables left over from the weekend. Healthy and budget friendly! Today, I bring you my take on vegetable fried rice. 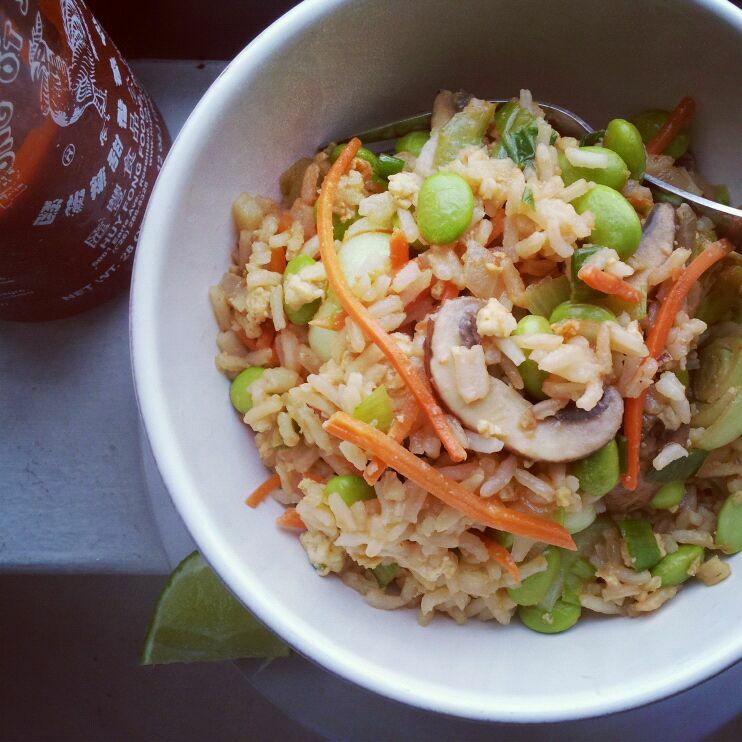 A great combination of brown rice, vegetables, and spicy (yet “citrusy”) soy sauce. This Meatless Monday meal takes very little time to come together. Just the dish you need to get back on track after a weekend of indulgence. I like my fried rice spicy, so I serve this dish with extra sriracha hot sauce on the side. If you do not like spicy food, simply leave it out. Cook rice according to package directions, reserve. Alternatively, use 4 cups of leftover brown rice. Heat wok (or large saute pan) to medium heat and spray with olive oil cooking spray. Add eggs, scramble for 30 seconds, then remove from wok and reserve. Add 1 tbsp oil to wok and turn heat to high. Add chopped onion, garlic, and white parts of the greed onions. Cook 30 seconds, being careful not to burn. Add mushrooms, carrots, bok choy and edamame. Cook 5 minutes until vegetables are tender and cooked through. Add cooked rice and the rest of the green onions. Stir to combine. In a small bowl, combine soy sauce, sriracha, and lime juice. Add sauce to rice mixture. Toss to combine. Enjoy any additional sriracha and lime juice.